The Mamuta (ミウリン?) is an enemy found in the first two Pikmin games. It is fairly large, seemingly rocky and has two small eyes with dark markings around each one. Its body is notably asymmetrical with large, muscular arms that have strange markings around the wrists, and is covered in tiny white and gray hairs. The single Mamuta in the first game is neutral, and just stands and watches when Pikmin walk by; if any harm comes to it, however, it becomes enraged and attacks. In Pikmin 2, however, Mamutas are more aggressive, attacking Pikmin and leaders when they approach. These creatures attack by pounding Pikmin into the ground. This doesn't kill them, but replants them and turns them into flowered Pikmin by some unknown process. This can be used to one's advantage, though it can get very annoying when it comes to plucking the Pikmin if one is in a hurry. With the Pluckaphone, however, a Mamuta can do more good than bad, as the planted Pikmin can simply be called out of the ground. Leaders, as opposed to Pikmin, do take damage from Mamuta attacks. In the first Pikmin game, Olimar, like his Pikmin, can be pounded into the ground. This causes the creature to stop attacking and appear to relax, after emitting some odd donkey-like noises; it will only attack again if Pikmin are plucked or if it is attacked. 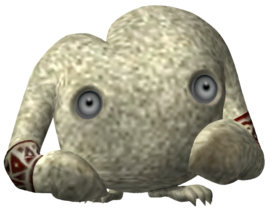 In Pikmin, the Mamuta is found at The Impact Site on even-numbered days, starting on day 8 (on odd-numbered days, the Goolix is encountered instead), but in Pikmin 2, Mamutas are only found underground, and their health and weight is less than in Pikmin. A Mamuta inside the Frontier Cavern holds the Brute Knuckles, making it the only non-boss enemy which carries a piece of the Explorer's Friend Series, which constitutes the Exploration Kit. There is no threat to your Pikmin, only the problem of having to pluck planted Pikmin, which can take a while without the Pluckaphone (Pikmin 2 only), although it can be troublesome if the Mamuta hits the leaders, incapacitating him for a second or more. Throwing Pikmin onto it from a distance is often more effective to avoid this than swarming, unless Olimar is accompanied by a large group of Pikmin. Attacking from behind is also advantageous. Purple Pikmin allow for an especially easy defeat. One must try to be careful; some Pikmin being planted is inevitable, but if all of your army is planted, then it is likely that you will have to either resort to throwing and calling back two or three salvaged Pikmin, as the Mamuta will attempt to attack you if you pluck any more than that; or, you could be forced to use the below strategy, which is marginally simpler and much harder. Although very difficult, Olimar can defeat the Mamuta by attacking it from behind. However, it is recommended that Olimar uses Pikmin, as attacking the Mamuta by himself is time-consuming. In Pikmin 2, this is less of a problem due to Mamutas only appearing in caves with no time limit. Also, the Mamutas in both games cause major damage to Olimar and, at least in the first game, can land multiple hits on him while he is incapacitated. This can damage him even to the point of death. Inexperienced players, beware. Both the English and Japanese names seem to have no real meaning. Its scientific name is also unknown, and the internal name in both games is simply the Japanese name (ミウリン? ), although written as miulin instead of miurin in Pikmin 2. Erroneously, its scientific name in the GameCube Interactive Multi-Game Demo Disc Version 18 is Mamuta. A Mamuta on the enemy reel. A Mamuta on the Piklopedia. A Mamuta surrounded by Pikmin sprouts. The creature's e-card, #62 (8th yellow card). Interestingly, the patterns on the Mamuta's wrists are the same as the patterns on the Onions. In a prototype version of Pikmin 2, the Mamuta was meant to have a recipe, but it was scrapped and replaced to "inedible." In Pikmin, the Mamuta appears to be resistant to bomb rocks, taking minuscule damage when struck. In Pikmin 2, the Mamuta is never seen above ground, but it has an unused seed value of 8. The Burrowing Snagret's recipe in the Japanese version of Louie's notes is strikingly similar to that of the Mamuta's American notes, stating it's "like grilled chicken". Because of this, the Mamuta's recipe is very different in the Japanese Version, instead saying to be quick about boiling it as it spoils quickly, but to be kept for 2-3 days when boiling. Coincidentally, the early recipe for the Mamuta is exactly the same as the Japanese version, even changing it from inedible to edible. Smoky Progg – thought to be a malformed larval Mamuta. This article was a featured article from August 19th to March 16th, 2012. This page was last edited on January 27, 2019, at 14:54.